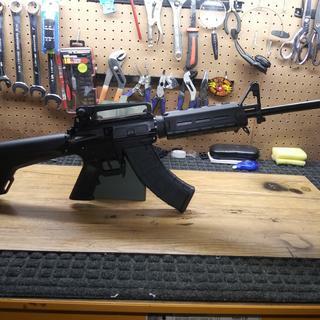 Twist Rate: 1 in 10"
Diameter at Gas Block: .750"
The Palmetto State Armory KS-47 G2 is based on the AR-15 and combines the modular construction, accuracy, and precision of the AR platform with the stopping power and the magazine options of the AK. 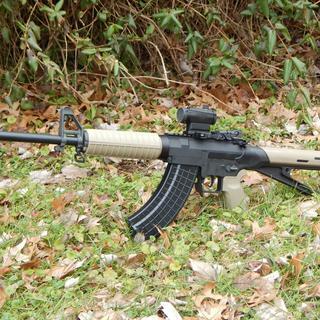 The KS-47 G2 lets the AK shooter capitalize on their inventory of AK magazines and AK ammo with an AR-style platform. Unlike the AK, where the barrel is permanently pressed into the receiver, the KS-47 G2 features an AR-style modular configuration which consists of a barreled upper receiver, and a lower receiver that houses the fire control group and magazine. The modular configuration allows customers to have several different barrel configurations with one lower receiver, just by releasing two pins. Lower: The 7075-T6 forged lower receiver is hard coat anodized, and accepts standard AR-15 fire control groups. The extended magazine release is outside of the trigger guard for safety, which allows for an AK-style release movement but also features oversize side paddles for fingertip release by the trigger finger. The KS-47 G2 receiver also accepts standard AR buffer tubes. The KS-47 G2 lower has steel reinforcements to accept AK style surplus magazines including drum-style. This Gen2 design features a PA-10 carbine buffer spring and heavy H1 buffer to ensure reliable operation with a wide variety of aftermarket and surplus magazines. Through extensive testing, we have determined that we can only guarantee the reliability of the KS-47 G2 platform with the PA-10 carbine buffer spring and heavy H1 buffer. The KS-47 G2 Lower will accept most aftermarket fire control groups (Geissele, etc.). However, due to the magazine catch geometry, one piece drop in triggers such as CMC style triggers will not function in KS-47 G2. Upper: The KS-47 G2 upper receiver is precision machined out of forged 7075 T6 aluminum, and then hard coat anodized for durability. While retaining the look of a standard M4 upper, the KS-47 G2 upper is designed to work with the new Gen2 KS-47 lower. The upper features integrated over-insertion tabs to prevent the bolt from dragging on the magazine. This CMV 4150 barrel is chambered in 7.62x39 with a 1 in 10 twist and has a single, large feed ramp to accommodate the larger case diameter of the 7.62x39 round. The barrel is nitride treated for accuracy and durability, and is finished off with a 5/8-24 thread A2-style compensator. The forward assist, dust cover, charging handle, and safety are all standard AR-15, as are the PSA Classic Polymer Handguards. 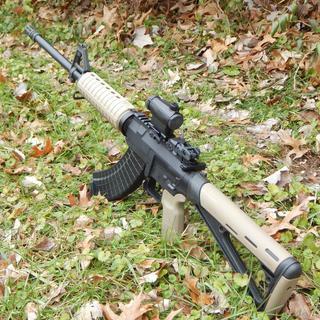 The KS-47 G2 upper will not work with a standard AR15 lower. BCG: The KS-47 Bolt carrier group is designed to work with AK-47 magazines, and features an extended firing pin. The carrier is made of nitride treated 8620 steel, and the gas key is attached with grade 8 bolts and properly staked. The bolt has been redesigned to function properly with most AK-47 magazines. The bolt is nitride treated 9130 steel. ** Due to the unique geometry required for the KS-47 G2 BCG to function, ALL other magazines will not be guaranteed to work. If you are using a magazine not listed above, no warranty claims will be accepted for magazine functioning issues. The KS-47 G2 uppers and lowers will function with the KS-47 G1 uppers and lowers. However, if any KS-47 G1 parts are used, all of the improvements of the KS-47 G2 may not be optimized. We recommend using Magpul AK-47 Magazines on any KS-47 that is a combination of Gen 1 and Gen 2 parts. Will you be making this is in a midlength gas system? If so when will that be available? BEST ANSWER: If you don't want headaches, stay clear of midlength 7.62x39. Honestly. Unless you plan on running Golden Tiger ammo exclusively. Tell me more. Why does a mid-length system in 7.62x39 perform poorly? I noticed that in an AR, unless you're running hot ammo, the mid length gassed AR's in 7.62x39 short stroke. Even when I opened the gas port to .160". In the AK it seems to work fine and the same in a piston AR with low-mass BCG's and reduced weight buffers w/ low power springs. Just what I've learned from personal builds. If theres something else I need to try, I'm all ears. Hope that helps. what is length and weight? BEST ANSWER: Length is about the same as any M-4 Carbine. The barrel is a little heavier so the weight will be more, 1/2 lb or so. Also if you add a freefloat hand guard the weight goes up. The Muzzle Thread is the same as the AR10 (5/8-24). Will a standard AR10 Muzzle Device work on this rifle given that the 7.62x39 projectile diameter is .312 vs .308 of the 7.62 Nato Round? Or is this A2 flash hider bored slightly larger than the standard AR10 one? I'm assuming this difference is negligible for a muzzle device. BEST ANSWER: Yes...any 30 cal muzzle device with a 5/8-24 RH thread will fit and clear a .311" dia. 7.62x39 projectile. Will i be able to mount a bayonet securely on this rifle? Or will it flop around stupidly like on a typical 16inch carbine AR? BEST ANSWER: It will flop around. When will the upper barrel assemblies be available? When will the KS-47 carbines come back into stock? Can i run wolf steel cased ammo reliably through this thing? BEST ANSWER: Yes you can. I have several hundred rounds through my new rifle without a single ftf or fte. This was a driving reason for my purchase. When are stripped uppers expected to be available? is there a 5 round magazine to use for hunting? BEST ANSWER: Yes. Magpul sells a 5 round magazine. Will regular mil-spec AR15 carrier work with KS47 bolt and upper assembly? Will AR15 float tube fit on the ks47 ? BEST ANSWER: Yes, same conditions as a normal AR15. will you make a dissipator version of this rifle someday? How can i obtain a 200.00 palmetto complete AR15 RIFLE? Does it use an ar15 bolt catch? How do we put it in battery? Is this coming out with a CHF barrel ??? I purchased this rifle just a few days ago. Right out of the box, the charge handle hung up and got stuck. The cartridges would not discharge. I carried it to a gunsmith (Still Brand New Gun) and he had to repair it. Too often we rely on reviews like these to determine if we purchase something. Always read the negative ones because mine is true. I should not have had a problem right out of the box. I was so disappointed after paying $599.99 for something that did not work. Be cautious if you chose to go ahead and purchase this gun. The best AR platform for the 7.62x39 round available. I am very pleased to have an AR platform that really works. You get the best of it all with a familiar weapon system that fires the 7.62x39 round from ANY manufacturer and uses common AK magazines including the pmag. I have had weapons from other highly respected manufacturers that cost three times as much and won’t fire common steel case ammunition. Great job Palmetto! After a long wait, I was excited to see the KS-47 come back into stock. So I was quite anxious to pick it up from my LGS. 940 rounds later I'm beyond satisfied. Not a single malfunction. And I've poured nothing but cheap steel case through it. From Monarch to Red Army Standard, to Tula and Barnaul. It's ate everything without hesitation. I switched the out the collapsible carbine stock and buffer tube for an A2 buffer tube and a Hogue A2 fixed skeletonized stock. Retaining the old buffer and spring by using a buffer tube spacer. Couldn't be happier. I look forward to giving it a twin. Very nice rifle. Seems like I waited a year or for you guys to produce 'em again. Well worth the wait! I picked up from my ffl dealer and it was hard to charge so I asked the dealer to try it he remarked man that's hard to charge take it home and spray it up good maybe it needs lube.I got home i could pull the charging handle back at all.I separate the lower end and pulled out the charging handle and the damn thing was bent how hell does that even happen? ?Replace it now works fine.20 bucks later. PSA KS-47 with rifle stock conversion. Mine amazed me. I shot 3 5 shot groups of 1 inch at 100 yards. This was with golden tiger steel and tula 154 sp. . I had one called flyer in each group. Freaking amazingly accurate. Then rang Steel using the 7.62x39 scope i bought on sale here at psa. Steel was at 220 and the 200 yard mark was right on.